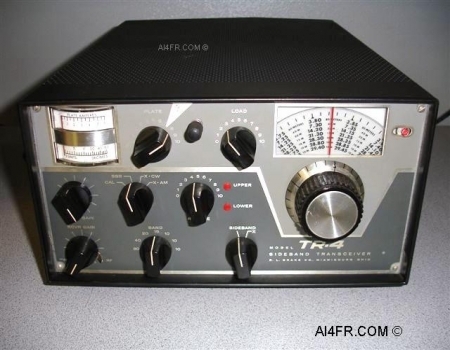 The R.L, Drake model TR-4 is an 80 through 10 meter amateur band transceiver. 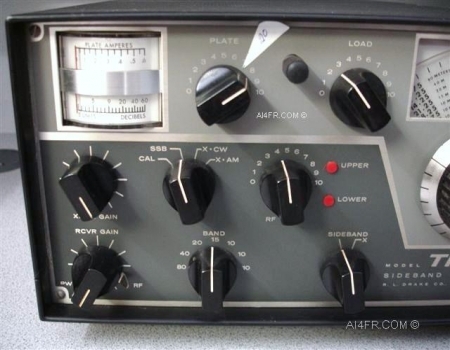 The modes of operation are SSB, AM and CW. Full coverage on all amateur bands, 10 through 80 meters is accomplished in seven 600 kc ranges which is as follows, 3.5 to 4.1 mc, 7.0 to 7.6 mc, 13.9 to 14.5 mc, 21 to 21.6 mc, 28 to 28.6 mc, 28.5 to 29.1 mc and 29.1 to 29.7 mc. 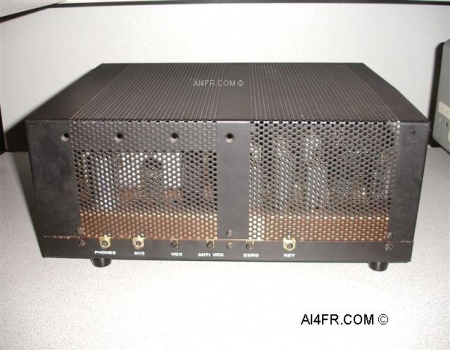 Upper sideband and Lowe sideband selection is accomplished by switching between two 9 mc crystal lattice filters which have a 2.l Kc passband. 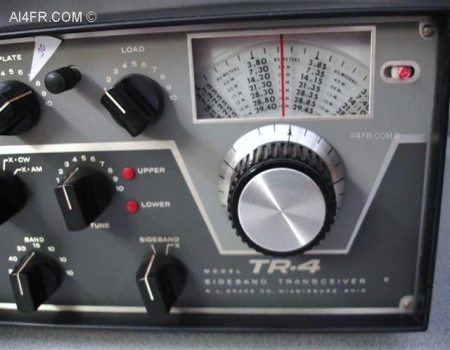 The TR-4 transceiver is loaded with features. These features include a VOX circuit for SSB and AM, diode detection for AM, shifted carrier CW, automatic transmit receive switching on CW, built in CW side tone, separate RF and AF gain controls, a solid state VFO with linear permeability tuning, transmitting and receiving AGC indicator, a plate ammeter and RF output indicator, an adjustable pi-network output, and built in crystal calibrator. The TR-4 uses two 6JB6 sweep tubes for the finals. Due to the 300 watt P.E.P. input rating, the TR-4 will require a power supply capable of low voltage at high current with very good dynamic regulation. The voltage and current requirements are as follows: 650 volts at 300 ma average and 500 ma maximum with 10% regulation from 100 ma to 500 ma and a maximum ripple of less than 1%. 250 volts at 175 ma with 10% regulation from 150 ma to 180 ma. This includes the effect of the 650 volt supply change if both voltages are obtained from the same transformer. Maximum ripple must be less than 1/4 %. Also needed is a -45 to -65 VDC adjustable filtered bias into 33 KOhm load and 12.6 Volt AC or DC at 5.5 amps. 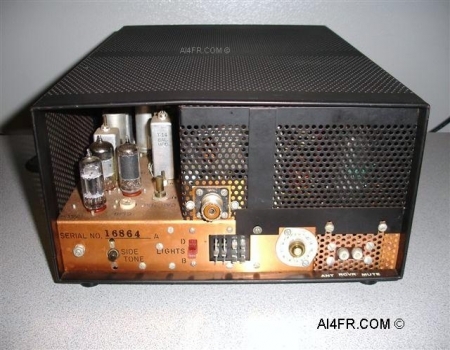 The TR-4 has 20 tubes including the voltage regulator, four transistors and nine diodes. The addition of the accessory RV-3 or RV-4 remote VFO speaker combination enables the operator to receive, transmit, or transceive throughout the band being used without disturbing the TR-4 tuning dial. 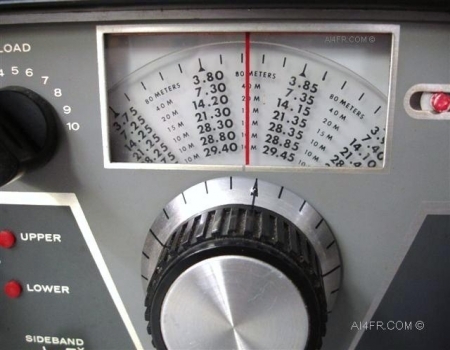 This is useful for working DX stations that are operating outside of the US phone bands, or for working near your own frequency in search of a clear spot under crowded band conditions. These next two photographs are close up pictures of the face of the TR-4. Notice the cheat marker applied by a former owner so he would know where to set the plate control for quick tuning on the 20 meter band. In the picture on the right, the small red knob in the upper right corner is known as a fiduciary control and allows the operator to zero in the main tuning dial so the correct frequency is displayed. The picture on the left is showing the side of the TR-4. An important factor to consider before you decide to purchase a Drake of this vintage is the location in which you plan on keeping the radio. Notice in the left picture the location where all of the accessory plugs are located. These accessory plugs are for the mic, ear phones and CW key. There is also a number of adjustments for VOX operation and S-meter zero located on this side. If one plans to put this Drake next to another radio then the operator should keep in mind these accessory plugs and adjustments and the access to them. Having these plugs on the side of this transceiver can pose a problem in certain Ham shack configurations. The photograph on the right is of the rear of the TR-4. As was common with many of the Drakes and some National products among others, was the copper plated chassis as can be seen in the two pictures above.